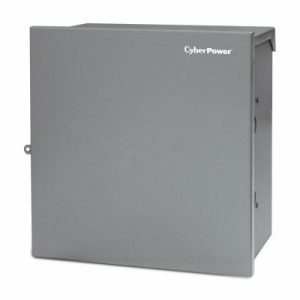 Designed for exterior installation, the CyberPower CS150U48V3 Outdoor CyberShield™ FTTx System allows service providers easy access to the power supply and batteries. Outdoor mounting eliminates the need to schedule a service appointment with a subscriber to enter a residence or business location. The CS150U48V3 supplies continuous 48 VDC to local power network interface devices (NID), cable telephone modems, wireless base stations, fiber to the home (FTTH), optical network terminals (ONT), and integrated access devices. Outdoor Design – Provides durable, weather-proof casing to protect the model and features outdoor mounting for access to the power supply and batteries. Reset Button – Momentary shut-off of DC output. LED Status Indicators – Provide information about the control and operation of the model related to AC/DC mode, battery missing, and DC output. Accessories – Pole Mount Kit (PMK-150-8X), Battery Heater (BTH-150-8X). Three-Year Limited Warranty – Covers defects in materials and workmanship in the product under normal use and conditions within three years of the purchase date. See warranty for details.